We are proud of our inclusive ethos. Every year we welcome thousands of students and hundreds of teachers from primary, secondary and special schools. 35 students can participate from each school, and we usually work with ages 8-18. Each school's place in the Festival is subsidised by SSF. To find out more about the cost, click here. Register your school for the Shakespeare Schools Festival and take your first step to transforming the lives of your students. You will be introduced to your dedicated Festival Coordinator who will guide you through the thrilling months ahead. Before you know it, your young people will be performing on a professional stage! Once registered, your website login will give you access to the backstage area of our website so you can browse our extensive bank of resources. You can also read our specially abridged scripts, choose your play, share tips in our online Green Room and be supported and inspired by the SSF team and other Teacher-Directors. In this full day of CPD, SSF Artistic Associates provide you with a practical director’s toolkit. 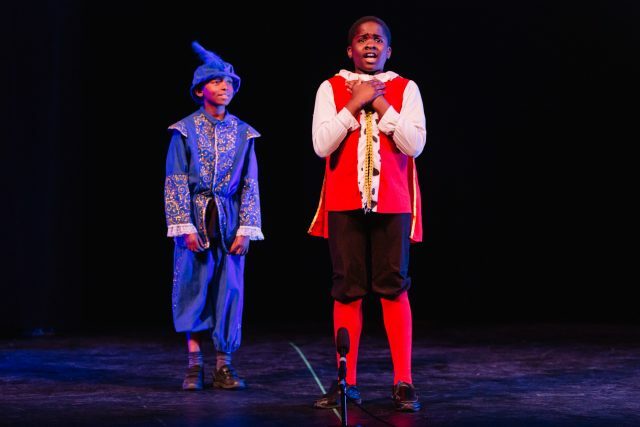 Whether you're a total beginner or a drama expert, whatever the age and ability of your pupils, we will equip you to direct a Shakespeare play with your young people in a way that is active, aspirational, fun and inclusive. We bring together two local schools for a half-day workshop led by theatre professionals. We work with you and your company to develop your performance and to give you more tips and tricks to take back into the rehearsal room. We boost student and Teacher-Director confidence as the excitement builds towards your Performance Day. On your Performance Day, SSF staff lead each school in a technical and dress rehearsal and ensure that you feel ready and supported for the evening to come. In a celebratory finale to your Festival journey, you join other local schools as your young people take to the stage and share their hard work and success with your local community. Find out more about how the cost of the Festival is shared between the charity and the school, and more details of everything that is included here. Ready to sign up? Brilliant! Secure your place now by filling out the registration form.